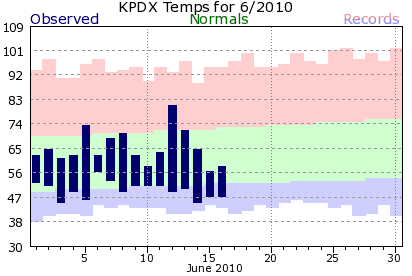 I talk a lot about Seattle wather in this blog (for obvious reasons), but as bad as it has been in western Washington, Portland and vicinity have been worse. 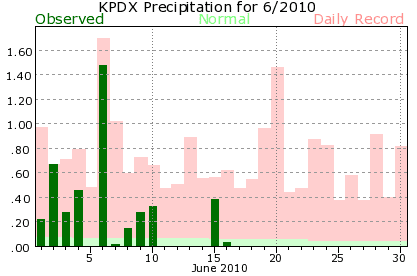 For example, Portland has broken its ALL TIME MONTHLY RECORD precipitation for June, HALFWAY through it. Impressive. There has been a persistent trough over the WA and as a result Portland has often got the brunt of incoming systems. Here are the temperature and precipitation records this month for Portland. Few days have risen to the normal highs, and the last few days have been extraordinary cool with highs not even reaching 60F. Some days have experienced all time record low highs. The soggy conditions reached a pinnacle on the 6th when Portland had 1.48 inches in a day. There is one major silver lining in this heavy-duty cloudiness....the waterfalls in the Columbia Gorge are running very high. I love waterfalls and headed down there this week and was not disappointed. Big flows, huge sprays, and warming up near the big fire at Skamania Lodge in Stevenson makes the cold go away. And all the while sun was always close by...just head east to Hood River or beyond and sun and relative warmth beckons. Or if you prefer fresh snow...no problem! 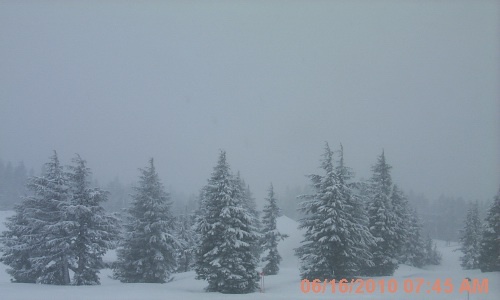 Head for Mount Hood, where several inches fell at Timberline Lodge (see top picture). We are now in a short improving trend and tomorrow should be partly cloudy and temps in the 60s. But I am afraid that things will go downhill on Saturday with a new upper low over us (see graphic), bring temps in the 50s and some precipitation.